I’ve always looking for less than traditional Easter basket ideas for my boys. I love taking a classic tradition and kind of turning it on it’s head to create something that’s so memorable and so perfectly tailored to the likes of my guys. In years past I’ve incorporated super hero themes, toy-free themes and non-basket themes but this year I really outdid myself and created what has got to be my favorite Easter basket idea ever! 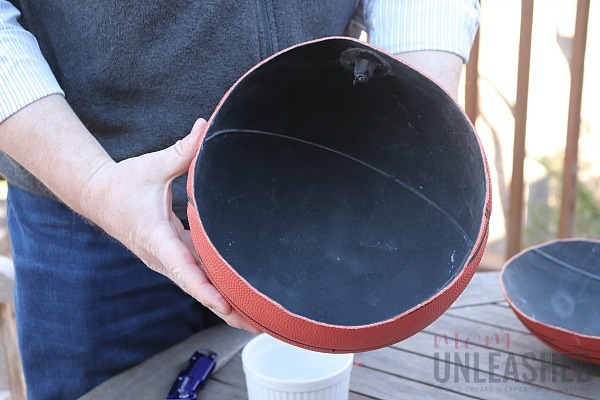 Read on to find out why I chose this bold yet crafty idea and learn how to create my Upcycled Basketball Easter Basket. It’s only fair to tell you that my guys are crazy about two things; sports and snacking (typical males right?). Both of them play sports all year round and truthfully, they’ve never met a sports game that they didn’t like. So, as I was thinking through Easter basket ideas this year, I knew I wanted to go with a sports related theme. As I racked my brain, I literally fell onto this idea of an Upcycled Basketball Easter Basket because, well, my garage is stuffed full of basketballs. After kicking about the 10th basketball out of the way one morning, it dawned up me that I could upcycle some of those old basketballs into the ultimate Easter basket for the sports loving kid. 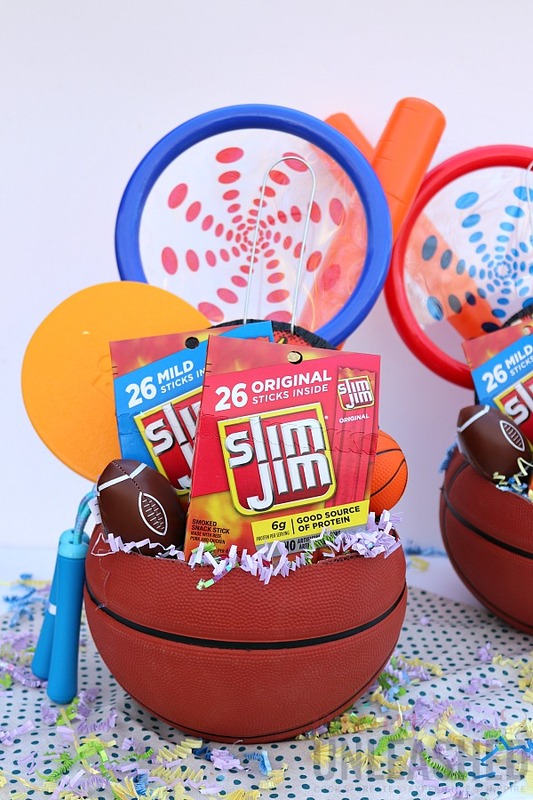 I (of course) quickly pulled the hubs into my scheme (he’s used to these crazy ideas by now) and we were able to come up with a way to turn basketballs into perfect Easter baskets with nothing more than a sharpie, a bowl and a box cutter…..and of course lots of fun goodies including Slim Jim Snack Sticks. 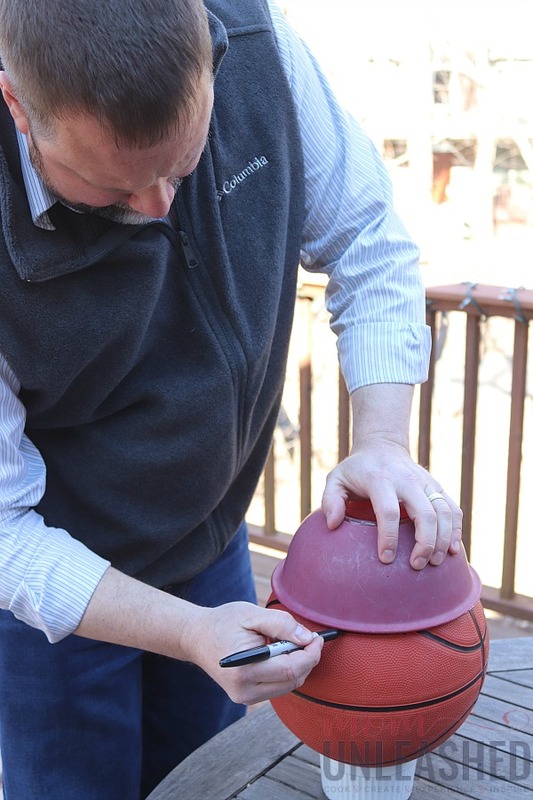 To make our Upcycled Basketball Easter Baskets, we simply placed our basketballs on a small bowl to stabilize them and then used a sharpie and a larger bowl to trace the opening onto our basketball. Once we had decided that we had the right size for the opening in the basketball, I let the hubs do the heavy lifting and use a box cutter to cut along the line, creating a basket out of our basketball. Pretty nifty huh? And just in case you don’t have a gazillion basketballs laying around like we do, you can pick one up in the bargain bin at Walmart to create this fun craft. Once my hubby cut the top off of our basketball, I was feeling pretty excited. I quickly grabbed my Easter basket stuffing and filled my cut basketballs with it until it was almost overflowing. Then, the question became what items were bold enough to go into this creative and fun Upcycled Basketball Easter Basket. I headed back to Walmart in search of Easter basket stuffers and let me tell you, there were plenty of items that fit perfectly with my sports lover theme. I found plastic baseball bats, ping pong paddles, jump ropes and more, all for great prices that made stuffing my Upcycled Basketball Easter Basket easy. But the thing that I knew I was missing was a snack idea that was as bold as my the basket itself. 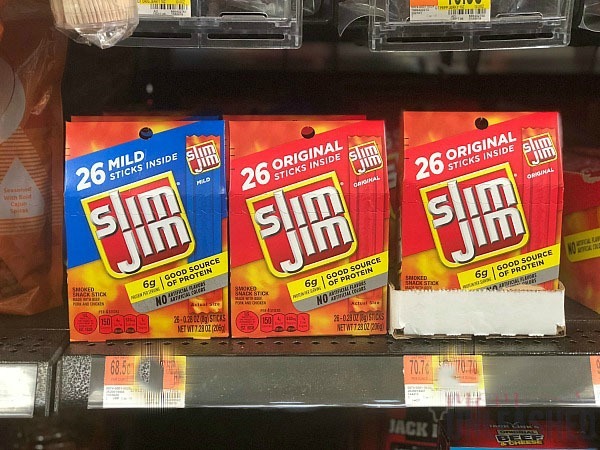 As I perused the aisles, I noticed what just happens to be one of my boy’s favorite snacks…Slim Jim Original and Mild Smoked Snack Sticks in perfectly sized 26-count boxes. 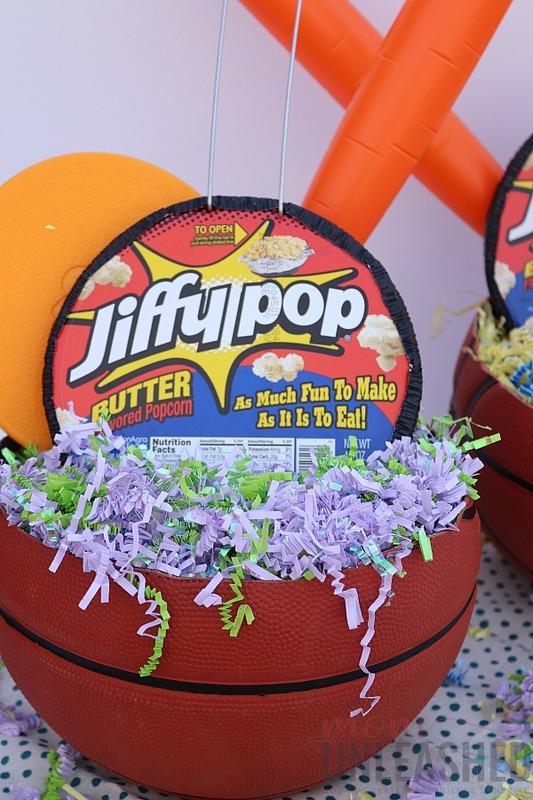 All of a sudden, all the stuffers for my Upcycled Basketball Easter Basket came together in perfect unison and I might just have been guilty of a little fist-pumping in the snack aisle as I loaded this bold Easter essential to my cart. 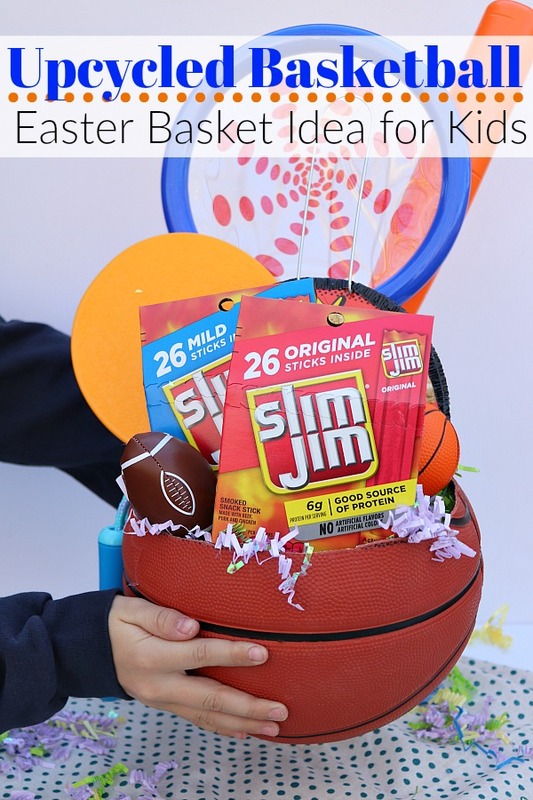 Once I was back home with my prepared Upcycled Basketball Easter baskets and all my goodies including Slim Jim Snack Sticks from Walmart, all that was left to do was stuff my basket in a perfectly bold way. I started by adding some of the fun sports themed toys I had been able to purchase at Walmart and a pack of Jiffy Pop since my boys adore popcorn. I then moved on to the addition of my Slim Jim Snack Sticks. As America’s #1 brand of meat stick, these individually wrapped Slim Jim snack sticks are made with beef, pork and chicken because beefy appetites (like the ones my boys have) need a beef-filled snack. I had purchased both the Slim Jim Original Flavored Smoked Snack Sticks that boast 7 grams of protein per serving and the Slim Jim Mild Smoked Snack Sticks. 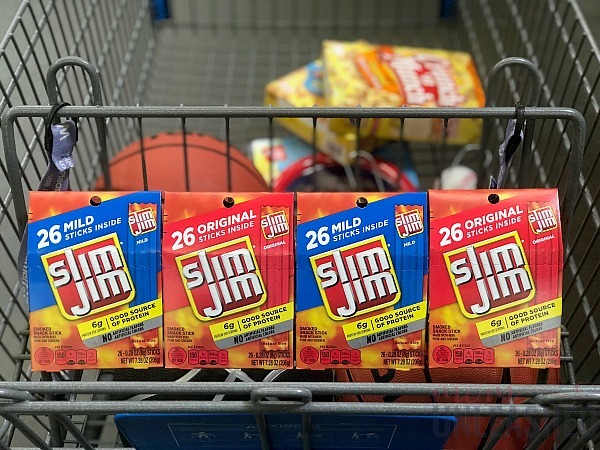 One at a time, I began added my Slim Jim snack sticks that are the perfect quick and easy meat snack for my boys after they’ve played their favorite sports into the baskets. 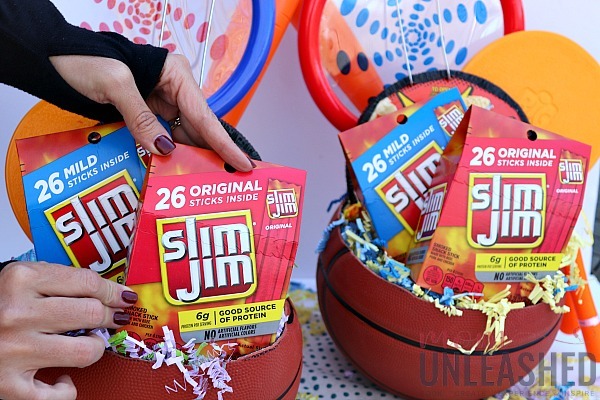 After nestling my Slim Jim Mild Smoked Snack Sticks into my Upcycled Basketball Easter Basket, I added my second box of Slim Jim Original Smoked Snack Sticks. The addition of these two products took my already cool Easter basket idea and make it into a bold creation that I knew my boys would adore. Once I completed my Upcycled Basketball Easter basket idea by adding a few plush sports balls to round out my bold look, all that was left to do was sit back and enjoy the fact that with some old basketballs, a few inexpensive sports toys and Slim Jim Snack Sticks from Walmart I had literally created Easter basket perfection for the sports loving kids in my life. 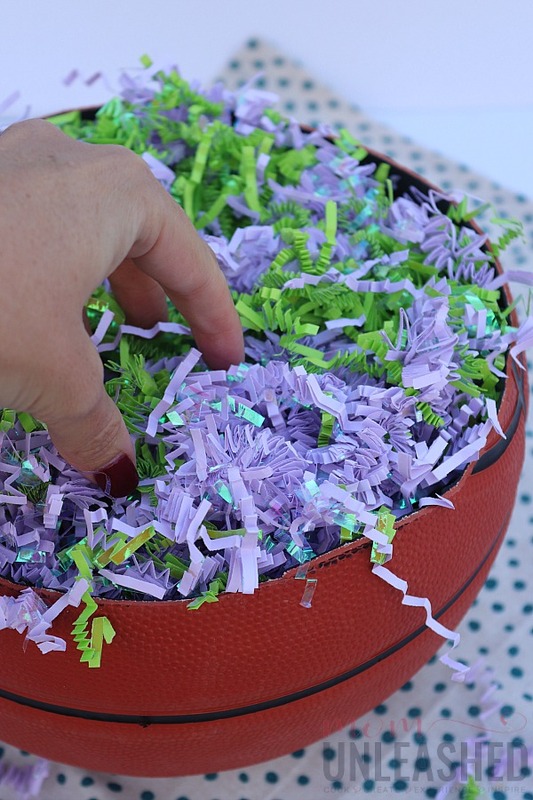 I dare you to show me one sports loving kiddo who wouldn’t flip over this bold Upcycled Basketball Easter Basket idea! It’s literally the perfect way to mix things up while creating an Easter basket idea that’s perfectly unique, just like my boys are. 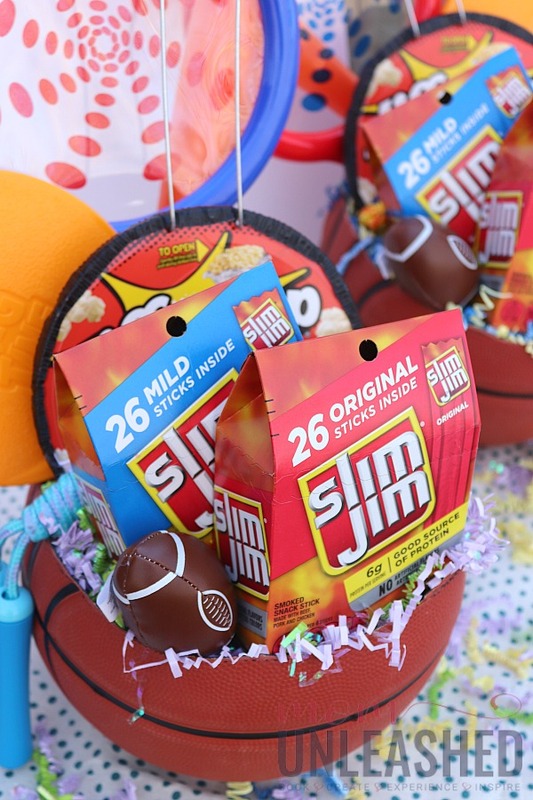 My advice to all you moms out there who really want to make your Easter basket stand out this year is to go big, go bold and always include Slim Jim Snack Sticks regardless of whether you create my Upcycled Basketball Easter Basket or come up with something that’s totally unique to your child! But wait! 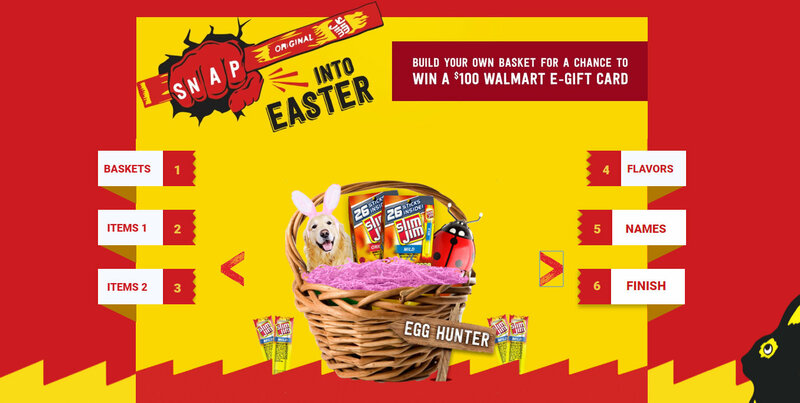 Before you head to Walmart to pick up all the supplies to make your Easter basket creation bold this year, be sure to visit SlimJimBoldBreak.com to create your bold virtual Easter basket for a chance to win a $100 Walmart eGift Card! Entering is as easy as adding fun virtual items to your basket and making sure to include delicious Slim Jim products in your creation. You can even come back each day to make fun new baskets and share them on social media for additional entries. So go! 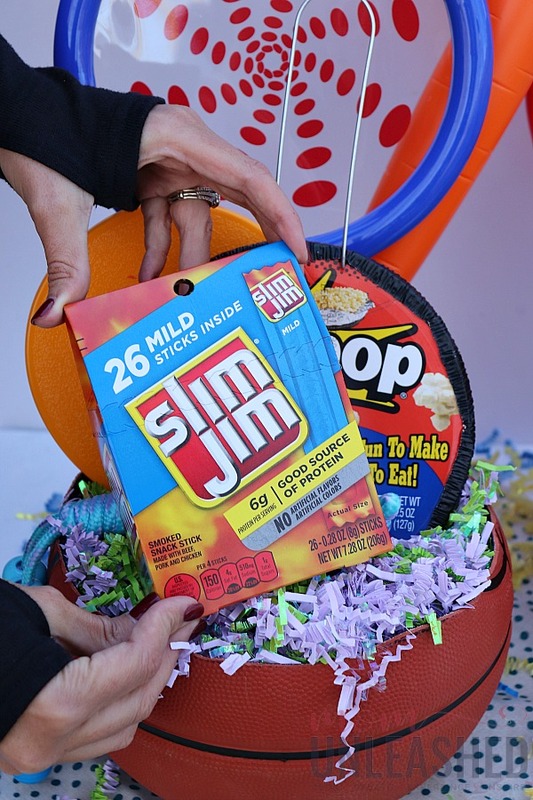 Enter at SlimJimBoldBreak.com by creating your virtual Easter basket. 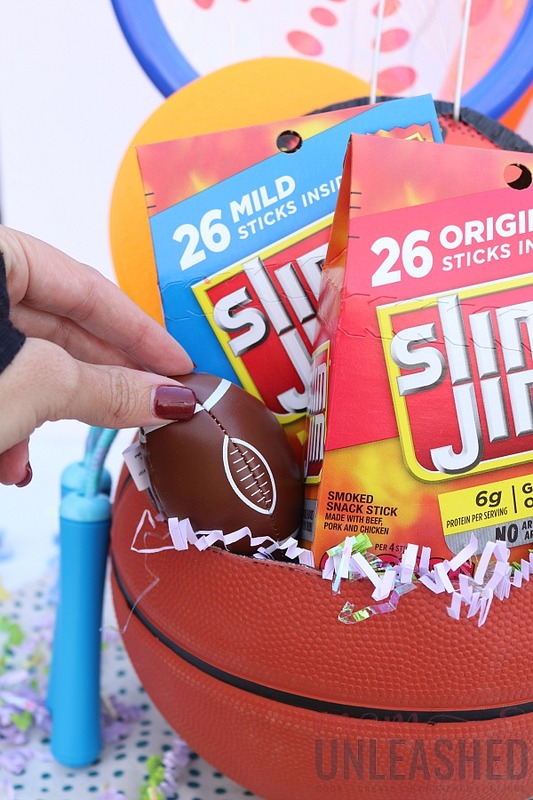 Once you’ve entered head to Walmart to stock up on Slim Jim Snack Sticks and everything else you need to create the perfect Easter Basket for your kiddos. Then tell me, do you have a sport loving kid in your life who would flip over this Upcycled Basketball Easter Basket? That is a great idea for a basket! My husband and son are huge basketball fans. They’re going to love this. My son loves basketball! This basket idea for Easter will go over well with him! What a fun way to make an Easter basket for a tween/teen!! So easy to make too! Love that idea with the ball and fun treats inside of it. My kids would be sooo excited to see this. What a clever idea! My son plays basketball I bet he would get a kick out of this Easter basket! This looks like such a fun basket!! I know my son would love it too! That is a really creative way to make use of old basketballs! I am sure your sons would love the surprise! I have to steal this idea and make use of my sons’ worn out basketballs sitting in the attic. OMG! What a wonderful diy idea! I know a lot of people that would be happy to receive such a gift for Easter! 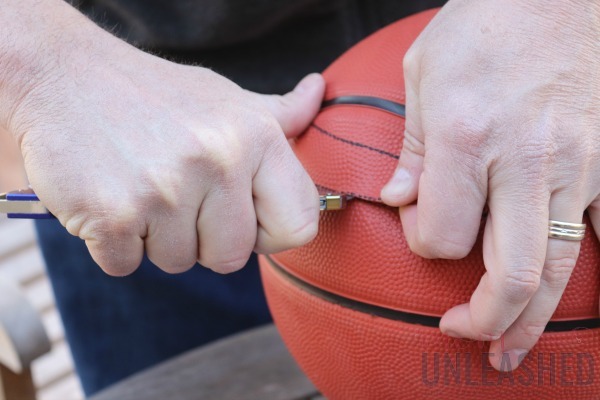 That is such a smart idea – I never would have thought to use a basketball! Looks fun for boys! What a great idea for an Easter basket. My son would like the Slim Jims in his basket this year, as well as my husband. I love this Easter basket idea!! It’s so cute and basketball-loving kids will think this is super amazing! What a great idea! We love snacks too, I’d love to taste this! I love the idea of this. I am sure my nephew will love this one! Thank you for sharing. Woow, that was a smart idea. Why didn’t i think of that. We have two of them around here somewhere. By the way the pictures look really amazing.